You talking about AI pathing does mean we can use alive cqb module with them? I assume so, not used Alive in a long time. Update frontpaged on the Armaholic homepage[/b]. This was a fix for map makers if you don't make maps and make just missions in the editor the first iteration is still ok.
Future updates will not be obfuscated. Has anyone seen this addon distributed elsewhere? Download link is broken on armaholic. One of the team said it was down but it is working now. The requested file was not found. The Armaholic staff has been informed of this error. We will fix the downloadlink as soon as possible. Which link are you trying? I see the issue now. It's something the Armaholic staff is going to have to fix. Thats really nice, it changes middle eastern maps totally. Im working on a small map with a medium size city and it looks great. There are a lot of things that are not working now. I would like to help you reporting things to fix. What is the way to report? I will update the first post on how to report errors. There are things we are aware of but whatever you find we may have overlooked it. So report away what ever it is. Main thing we wanted to do was get something out to you that was at least play worthy to a point where you could fight in them. If you find they are unbareable to fight in. We can only apologise and try our best to fix things. The most likely option is a full fix on the whole pack and get a full update out. This may change depending on what we plan to do. Thanks for downloading and giving us some great feedback so far. We kinda knew you'd all like what opteryx had built to begin with and that they just had to be finished. Is that running JUST rso buildings?? NOTHING else? 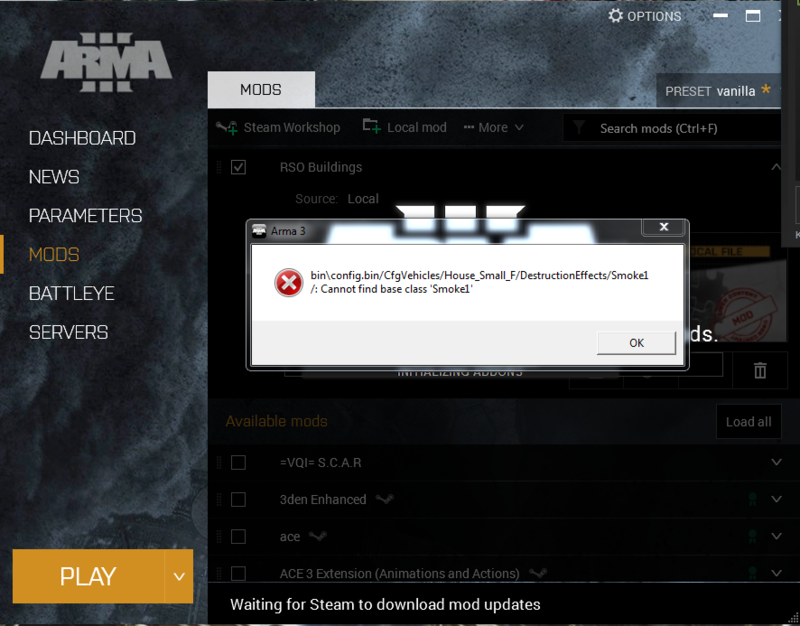 Can you still run the mod regardless of that error? Just to note, it is xmas day and for me its family day so i am unable to do anything physically about any errors until i get back home. That will not be until after the weekend. @spookygnu nope. It gives me a CTD Error and its running stable build, just RSO mod. Like i said i can't or we can't do anything about it now until after the weekend. Ok, I've managed to replicate this error and I don't know why I have had to use CUP to get it to work. It seems there is something there that "may"be related to the CUP addon. What IDK. I am not a config tech whizz, I will need some assistance from the team or anyone else that knows what might be causing the error. I have always loaded the addon with cup in the past only due to the map I am working on relying on CUP. RSO buildings was built completely independant to CUP just so you all know. So why it works with CUP loaded and doesnt' without it, I have no idea. It might be something to do with ruied model, but again, that is an a3 structure I have used in the config. I'm a bit puzzled atm. But let me work on it, for now, if you have it, CUP may have to be a dependancy as much as I don't want it to be. The fact that it doesn't happen with CUP Terrains loaded is slightly concerning to me, as it could mean that CUP Terrains is altering base classes. Hopefully that's not the case, and it's instead something silly like loading CUP Terrains and your addon leads to a longer startup time during which it loads the vanilla structures config before it's able to load your config. Either way, I'll look into a little further. Thanks mate. I will add that in later. This is completely unrelated. But anything happening with the Al Kut map? It's been a year or two but I really I wanted that map to be out. If its completely unrelated why ask it in a thread that is completely unrelated and then say, this is completely unrelated. The thread you want is funnyily enough named al kut! Not rso buildings pack. Since the goal with the Al Kut project was to have 100% custom assets I gave up on the project due to the incredibly heavy workload. However, now that RSO has picked up on finalizing my assets, it's not unthinkable that I will resurrect Al Kut in the future. Any further discussion regarding this topic should be posted in the Al Kut thread. I can see the shadow of the parking garage through all of the other buildings. Also, I see some textures missing for some stairs. And lastly the Arches with the spiral staircase isn't movement friendly. But it's a great addition, and it will be super awesome once some of these issues are fixed. Be great if you could text file these too us mate and list the building names in the thread.